Another one of my staple breakfast recipes that I cannot live without. So simple that you don’t actually believe the recipe is going to turn into a magical little fluffy pancake but it does! I use to buy those pancake shaker mixes when I was younger thinking I was the man whipping up my super pancakes which had me feeling bloated and not so ready to take on the day. These on the other hand will have you feeling great. You can add a handful of berries to the mix and easily change the taste so that it does not get repetitive. 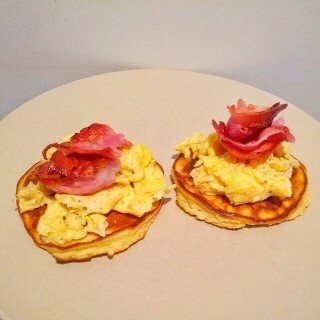 I personally like to throw some egg and bacon on top so that I still have enough fuel for a workout. A tip to keeping the coconut flour paleo pancake fluffy is not to cook it for too long which will dry it out and be like eating cardboard. I usually cook on low heat and then wait until there is a couple of bubbles before flipping. The other side only needs a quick minute and then you are ready! Quite simple really. Here is the recipe, I hope you enjoy it as much as I do. Breakfast, Recipes breakfast, coconut, pancake. permalink.